Since 2006, beekeepers have noticed something wrong with the hives of honeybees they maintain. The colonies of bees were slowly disappearing. This phenomenon is called Colony Collapse Disorder (CCD) and its cause is still a mystery. CCD is different from a colony dying out because the queen bee has expired or is no longer present. With CCD, the queen is still alive and present and the capped brood (bee eggs and larve) are still unhatched. This is peculiar because bees never leave the hive until the brood has hatched. Colony Collapse Disorder is a global phenomenon. Countries experiencing CCD are Belgium, France, the Netherlands, Greece, Italy, Portugal, and Spain. Bee hives in Switzerland and Germany also are suffering from CCD in a lesser extent and there are reports that Taiwan is affected as well. Although crops such as corn, wheat and rice are wind pollinated, fruits and vegetables are dependent on honeybee pollination. 80% of all flowering plants rely on honeybee pollination. CCD is a very serious matter. Honeybees are responsible for more than 30% of the world's food. Pollination by bees is heavily relied on by agricultural crops and the number of bee colonies has fallen by 45 percent in the last 60 years. The United States has resorted to importing bees from Australia, something not done since the 1920s. Theories abound on the exact reason for CCD such as malnutrition, pathogens and immunodeficiencies, mites and parasites, fungus, pesticides, beekeeping practices, and even electromagnetic radiation created by power lines along agricultural land. But these remain theories. After six years of extensive research and observation, the mystery still lingers and scientists are still baffled. The impact of crop pesticides on honeybee colonies is unlikely to cause colony collapse, according to a paper in the journal Science today (20 September 2012). More research is now needed to predict the impact of widely-used agricultural insecticides, called neonicotinoids, on honeybee populations. 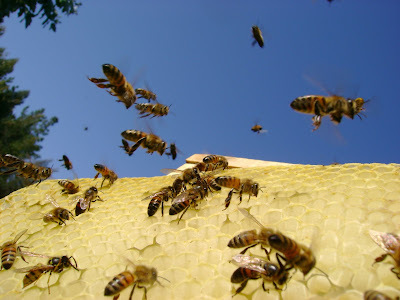 UK scientists from the University of Exeter and Food and Environment Agency highlight flaws in previous research (published in Science, April 2012) that predicted that neonicotinoids could cause honeybee colony collapse. Neonicotinoids are among the most widely-used agricultural insecticides and honeybees ingest residues of the pesticides as they gather nectar and pollen from treated plants. The previous research has been cited by scientists, environmentalists and policy-makers as evidence of the future impact of these pesticides on honeybees. It is likely that the research was instrumental in the French government's recent decision to ban the use of thiamethoxam, a neonicotinoid that is the active ingredient of Cruiser OSR, a pesticide produced by the Swiss company Syngenta. However, the new paper argues that the calculations made in the research were flawed because they failed to reflect the rate at which honeybee colonies recover from losing individuals. The previous research, led by French scientist Mikaël Henry, showed that the death rate of bees increased when they drank nectar laced with a neonicotinoid pesticide, thiamethoxam. It calculated that this would cause their colony to collapse. The research published today explains how the calculation may have used an inappropriately low birth rate. Lead author Dr James Cresswell of the University of Exeter said: "We know that neonicotinoids affect honeybees, but there is no evidence that they could cause colony collapse. When we repeated the previous calculation with a realistic birth rate, the risk of colony collapse under pesticide exposure disappeared. "I am definitely not saying that pesticides are harmless to honeybees, but I think everyone wants to make decisions based on sound evidence – and our research shows that the effects of thiamethoxam are not as severe as first thought. "We do not yet have definitive evidence of the impact of these insecticides on honeybees and we should not be making any decisions on changes to policy on their use. It is vital that more research is conducted so that we can understand the real impact of neonicotinoids on honeybees, so governments can put together a proper plan to protect them from any dangers that the chemicals pose."